Most counties have subdivisions which may include municipalities and unincorporated areas. Others have no further divisions, or may serve as a consolidated city-county. Some municipalities are in multiple counties; New York City is uniquely partitioned into five counties, referred to at the city government level as boroughs. The number of counties per state ranges from the 3 counties of Delaware to the 254 counties of Texas. The specific governmental powers of counties vary widely between the states. Counties have significant functions in all states except Rhode Island and Connecticut, where county governments have been abolished but the entities remain for administrative or statistical purposes. The Commonwealth of Massachusetts has removed most government functions from eight of its 14 counties. The county with the largest population, Los Angeles County (10,170,292), and the county with the largest land area, San Bernardino County, border each other in Southern California (however four boroughs in Alaska are larger in area than San Bernardino). Territories of the United States do not have counties (except for American Samoa, which does have them); instead, the United States Census Bureau divides them into county equivalents. While America Samoa does have its own counties, the U.S. Census Bureau counts American Samoa's districts and atolls as county-equivalents. Counties were among the earliest units of local government established in the Thirteen Colonies that would become the United States. Virginia created the first counties in order to ease the administrative workload in Jamestown. The House of Burgesses divided the colony first into four "incorporations" in 1617 and finally into eight shires (or counties) in 1634: James City, Henrico, Charles City, Charles River, Warrosquyoake, Accomac, Elizabeth City, and Warwick River. America's oldest intact county court records can be found at Eastville, Virginia, in Northampton (originally Accomac) County, dating to 1632. Maryland established its first county, St. Mary's, in 1637, and Massachusetts followed in 1643. Pennsylvania and New York delegated significant power and responsibility from state government to county governments and thereby established a pattern for most of the United States, although counties remained relatively weak in New England. When independence came, "the framers of the Constitution did not provide for local governments. Rather, they left the matter to the states. Subsequently, early state constitutions generally conceptualized county government as an arm of the state." In the twentieth century, the role of local governments strengthened and counties began providing more services, acquiring home rule and county commissions to pass local ordinances pertaining to their unincorporated areas. In some states, these powers are partly or mostly devolved to the counties' smaller divisions usually called townships, though in New York, New England and Wisconsin they are called "towns". The county may or may not be able to override its townships on certain matters, depending on the state constitution. The newest county in the United States is the city and county of Broomfield, Colorado, established in 2001 as a consolidated city-county. The newest county-equivalents are the Alaskan boroughs of Skagway established in 2007, Wrangell established in 2008, and Petersburg established in 2013. A consolidated city-county is simultaneously a city, which is a municipality (municipal corporation), and a county, which is an administrative division of a state, having the powers and responsibilities of both types of entities. There are 40 consolidated city-counties in the U.S., including Augusta, Georgia; Denver, Colorado; Indianapolis, Indiana; Jacksonville, Florida; Louisville, Kentucky; Lexington, Kentucky; Kansas City, Kansas, Nashville, Tennessee; New Orleans, Louisiana; Philadelphia, Pennsylvania; and San Francisco, California. Similarly, some of Alaska's boroughs have merged with their principal cities creating unified city-boroughs. Some such consolidations and mergers have created cities that rank among the geographically largest cities in the world, though often with population densities far below those of most urban areas. Independent cities: These are cities that legally belong to no county. They differ from consolidated city-counties in that in the case of a consolidated city-county, the county at least nominally exists, whereas in the case of an independent city, no county even nominally exists. As of July 2013[update], there are 41 such cities in the United States, including Baltimore, Maryland; Carson City, Nevada; St. Louis, Missouri; and all 38 cities in Virginia, where any area incorporated as a city is outside of the county jurisdiction. District of Columbia, outside the jurisdiction of any state, has a special status. The District of Columbia comprises the entirety of the District of Columbia, which, in accordance with Article 1, Section 8 of the U.S. Constitution, is under the jurisdiction of the U.S. Congress. When founded in 1801, the District consisted of two counties and three cities. In 1846, Alexandria County (which now forms Arlington County and a portion of the independent city of Alexandria)—including the then City of Alexandria—was given back to Virginia. In 1871, the three remaining entities—the City of Washington, City of Georgetown, and Washington County (which was coterminous with the District)—were merged into a consolidated government of District of Columbia by an act of Congress. Georgetown was abolished as a city by another act in 1895. Consolidated city-counties are not designated county-equivalents for administrative purposes; since both the city and the county at least nominally exist, they are properly classified as counties in their own right. The same is true of the boroughs of New York City, each of which is coextensive with a county of New York State. The U.S. Census Bureau counts all of Guam as one county-equivalent (with the FIPS code 66010), while the USGS counts Guam's election districts (villages) as county-equivalents. The U.S. Census Bureau counts the 3 main islands in the U.S. Virgin Islands as county-equivalents, while the USGS counts the districts of the U.S. Virgin Islands (of which there are 2) as county-equivalents. The site of a county's administration, and often the county courthouse, is called the county seat ("parish seat" in Louisiana, or "borough seat" in Alaska). Several New England counties use the term "shire town" for the county seat. Many counties are divided into smaller political or governmental units. In Northeastern and Midwestern states, counties are divided into civil townships (or "towns" in New England, New York, and Wisconsin), which may provide governmental or public services. Common sources of county names are names of people, geographic features, places in other states or countries, Native American tribes, and animals. Quite a few counties bear names of French or Spanish origin. Counties are most often named for people, often political figures or early settlers, with over 2,100 of the 3,144 total so named. The most common county name, with 31, is Washington County, for America's first president, George Washington. Up until 1871, there was a Washington County within the District of Columbia, but it was dissolved by the District of Columbia Organic Act. Jefferson County, for Thomas Jefferson, is next with 26. The most recent president to have a county named for him was Warren G. Harding, reflecting the slowing rate of county creation since New Mexico and Arizona became states in 1912. The most common names for counties not named after a president are Franklin (25), Clay (18), and Montgomery (18). 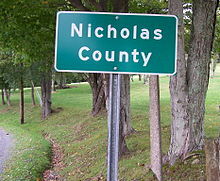 After people, the next most common source of county names are geographic features and locations, with some counties even being named after counties in other states, or for places in countries such as the United Kingdom. The most common geographic county name is Lake. Native American tribes and animals lend their names to some counties. Quite a few counties bear names of French or Spanish origin, including Marquette County being named after French missionary Father Jacques Marquette. The county's equivalent in the state of Louisiana, the parish (Fr. paroisse civile and Sp. parroquia) took its name during the state's French and Spanish colonial periods. Before the Louisiana Purchase and granting of statehood, government was often administered in towns where major church parishes were located. Of the original 19 civil parishes of Louisiana that date from statehood in 1807, nine were named after the Roman Catholic parishes from which they were governed. The powers of counties arise from state law and vary widely. In Connecticut and Rhode Island, counties are geographic entities, but not governmental jurisdictions. At the other extreme, Maryland counties and the county-equivalent City of Baltimore handle almost all services, including public education, although the state retains an active oversight authority with many of these services. In most Midwestern and Northeastern states, counties are further subdivided into townships or towns, which sometimes exercise local powers or administration. Throughout the United States, counties may contain other independent, self-governing municipalities. Counties are usually governed by an elected body, variously called the county commission, board of supervisors, commissioners' court, county council, board of chosen freeholders, county court, or county Legislature. In some counties, there is a county executive. In cases in which a consolidated city-county or independent city exists, a City Council usually governs city/county or city affairs. In many states, the board in charge of a county holds powers that transcend all three traditional branches of government. It has the legislative power to enact ordinances for the county; it has the executive power to oversee the executive operations of county government; and it has quasi-judicial power with regard to certain limited matters (such as hearing appeals from the planning commission if one exists). The day-to-day operations of the county government are sometimes overseen by an elected county executive or by a chief administrative officer or county administrator who reports to the board, the mayor, or both. In many states, several important officials are elected separately from the board of commissioners or supervisors and cannot be fired by the board. These positions may include county clerk, county treasurer, county surrogate, sheriff, and others. District attorneys or state attorneys are usually state-level as opposed to county-level officials, but in many states, counties and state judicial districts have coterminous boundaries. The structure and powers of a county government may be defined by the general law of the state or by a charter specific to that county. States may allow only general-law counties, only charter counties, or both. Generally, general-law local governments have less autonomy than chartered local governments. The power of county governments varies widely from state to state, as does the relationship between counties and incorporated cities. The government of the county usually resides in a municipality called the county seat. However, some counties may have multiple seats or no seat. In some counties with no incorporated municipalities, a large settlement may serve as the county seat. In New England, counties function at most as judicial court districts and sheriff's departments (presently, in Connecticut only as judicial court districts—and in Rhode Island, they have lost both those functions and all others), and most of the governmental authority below the state level is in the hands of towns and cities. In several of Maine's sparsely populated counties, small towns rely on the county for law enforcement, and in New Hampshire several social programs are administered at the state level. In Connecticut, Rhode Island, and parts of Massachusetts, counties are now only geographic designations, and they do not have any governmental powers. All government is either done at the state level or at the municipal level. In Connecticut and parts of Massachusetts, regional councils have been established to partially fill the void left behind by the abolished county governments. [e] The regional councils' authority is limited compared with a county government—they have authority only over infrastructure and land use planning, distribution of state and federal funds for infrastructure projects, emergency preparedness, and limited law enforcement duties. In the Mid-Atlantic and Midwest, counties typically provide, at a minimum, courts, public utilities, libraries, hospitals, public health services, parks, roads, law enforcement, and jails. There is usually a county registrar, recorder, or clerk (the exact title varies) who collects vital statistics, holds elections (sometimes in coordination with a separate elections office or commission), and prepares or processes certificates of births, deaths, marriages, and dissolutions (divorce decrees). The county recorder normally maintains the official record of all real estate transactions. Other key county officials include the coroner/medical examiner, treasurer, assessor, auditor, comptroller, and district attorney. In most states, the county sheriff is the chief law enforcement officer in the county. However, except in major emergencies where clear chains of command are essential, the county sheriff normally does not directly control the police departments of city governments, but merely cooperates with them (e.g., under mutual aid pacts). Thus, the most common interaction between county and city law enforcement personnel is when city police officers deliver suspects to sheriff's deputies for detention or incarceration in the county jail. In most states, the state courts and local law enforcement are organized and implemented along county boundaries, but nearly all of the substantive and procedural law adjudicated in state trial courts originates from the state legislature and state appellate courts. In other words, most criminal defendants are prosecuted for violations of state law, not local ordinances, and if they, the district attorney, or police seek reforms to the criminal justice system, they will usually have to direct their efforts towards the state legislature rather than the county (which merely implements state law). A typical criminal defendant will be arraigned and subsequently indicted or held over for trial before a trial court in and for a particular county where the crime occurred, kept in the county jail (if he is not granted bail or cannot make bail), prosecuted by the county's district attorney, and tried before a jury selected from that county. But long-term incarceration is rarely a county responsibility, execution of capital punishment is never a county responsibility, and the state's responses to prisoners' appeals is the responsibility of the state attorney general, who has to defend before the state appellate courts the prosecutions conducted by locally elected district attorneys in the name of the state. Furthermore, county-level trial court judges are officers of the judicial branch of the state government rather than county governments. In many states, the county controls all unincorporated lands within its boundaries. In states with a township tier, unincorporated land is controlled by the townships. Residents of unincorporated land who are dissatisfied with county-level or township-level resource allocation decisions can attempt to vote to incorporate as a city, town, or village. A few counties directly provide public transportation themselves, usually in the form of a simple bus system. However, in most counties, public transportation is provided by one of the following: a special-purpose district that is coterminous with the county (but exists separately from the county government), a multi-county regional transit authority, or a state agency. In western and southern states, more populated counties provide many facilities, such as airports, convention centers, museums, recreation centers, beaches, harbors, zoos, clinics, law libraries, and public housing. They provide services such as child and family services, elder services, mental health services, welfare services, veterans assistance services, animal control, probation supervision, historic preservation, food safety regulation, and environmental health services. They have many additional officials like public defenders, arts commissioners, human rights commissioners, and planning commissioners. Finally, there may also be a county fire department and even a county police department (as distinguished from fire and police departments operated by individual cities, special districts, or the state government). For example, Gwinnett County, Georgia, and its county seat, the city of Lawrenceville, each have their own police departments. (A separate county sheriff's department is responsible for security of the county courts and administration of the county jail.) In several southern states, public school systems are organized and administered at the county level. As of 2016[update], there were 3,007 counties, 64 parishes, 19 organized boroughs, 10 census areas, 41 independent cities,[f] and the District of Columbia for a total of 3,142 counties and county-equivalents in the 50 states and District of Columbia. There are an additional 100 county equivalents in the territories of the United States. The average number of counties per state is 62, with a range from the three counties of Delaware to the 254 counties of Texas. Southern and Midwestern states generally tend to have more counties than Western or Northeastern states, as many Northeastern states are not large enough in area to warrant a large number of counties, and many Western states were sparsely populated when counties were created. The five counties of Rhode Island, the eight counties of Connecticut, and eight of the 14 counties of Massachusetts no longer have functional county governments, but continue to exist as legal and census entities. The average U.S. county population was nearly 100,000 in 2015. The most populous county is Los Angeles County, California, with 10,170,292 residents in 2015. This number is greater than the populations of 41 U.S. states. It also makes Los Angeles County 17.4 times as large as the least populous state, Wyoming. The second most populous county is Cook County, Illinois, with a population of 5,238,216. Cook County's population is larger than that of 28 individual U.S. states and the combined populations of the six smallest states. The least populous county is Kalawao County, Hawaii, with 89 residents in 2015. 8 county-equivalents in the U.S. territories have a population of 0: Rose Atoll, Northern Islands Municipality, Baker Island, Howland Island, Jarvis Island, Johnston Atoll, Kingman Reef, and Navassa Island. The remaining 3 islands in the U.S. Minor Outlying Islands have small non-permanent human populations. The least populous county-equivalent with a permanent human population is Swains Island, American Samoa (17 residents). The most densely populated county or county-equivalent is New York County, New York (coextensive with the New York City Borough of Manhattan), with 72,033 persons per square mile (27,812/km2) in 2015. The Yukon-Koyukuk Census Area, Alaska, is both the most extensive and the least densely populated county or county-equivalent with 0.0380 persons per square mile (0.0147/km2) in 2015. In the 50 states (plus District of Columbia), a total of 981 counties have a population over 50,000; 592 counties have a population over 100,000; 137 counties have a population over 500,000; 45 counties have a population over 1,000,000; and 14 counties have a population over 2,000,000. At the other extreme, 35 counties have a population under 1,000; 307 counties have a population under 5,000; 709 counties have a population under 10,000; and 1,492 counties have a population between 10,000 and 50,000. At the 2000 U.S. Census, the median land area of U.S. counties was 622 sq mi (1,610 km2), which is two-thirds of the median land area of a ceremonial county of England, and a little more than a quarter of the median land area of a French département. Counties in the western United States typically have a much larger land area than those in the eastern United States. For example, the median land area of counties in Georgia is 343 sq mi (890 km2), whereas in Utah it is 2,427 sq mi (6,290 km2). The most extensive county or county-equivalent is the Yukon-Koyukuk Census Area, Alaska, with a land area of 145,505 square miles (376,856 km2). All nine of the most extensive county-equivalents are in Alaska. The most extensive county is San Bernardino County, California, with a land area of 20,057 square miles (51,947 km2). The least extensive county is Kalawao County, Hawaii, with a land area of 11.991 square miles (31.058 km2). The least extensive county-equivalent in the 50 states is the independent City of Falls Church, Virginia, with a land area of 1.999 square miles (5.177 km2). If U.S. territories are included, the least extensive county-equivalent is Kingman Reef, with a land area of 0.01 square miles (0.03 km2). In some states, a municipality may be in only one county and may not annex territory in adjacent counties, but in the majority of states, the state constitution or state law allows municipalities to extend across county boundaries. At least 32 states include municipalities in multiple counties. Dallas and Oklahoma City, for example, both contain portions of five counties. New York City is an unusual case because it encompasses multiple entire counties in one city. Each of those counties is coextensive with one of the five boroughs of the city: Manhattan (New York County), The Bronx (Bronx County), Queens (Queens County), Brooklyn (Kings County), and Staten Island (Richmond County). ^ At the time of the most recent 2010 census, 3,143 counties and equivalents were recorded in the 50 states and the District of Columbia, with another 100 county equivalents recorded in the territories (when the nine Minor Outlying Islands are included). Since that time, the independent city of Bedford, Virginia was dissolved and had its territory added to Bedford County, Virginia. Also, Alaska's Petersburg census area incorporated as Petersburg Borough, Alaska. The net result of these changes has been the loss of one county equivalent in the grand total. ^ The Unorganized Borough, Alaska formed by the Borough Act of 1961 is a legal entity, run by the Alaska state government as an extension of State government, it and the independently incorporated Unified, Home Rule, First Class and Second Class boroughs roughly correspond to parishes in Louisiana and to counties in the other 48 states. ^ These 11 statistical areas are used solely by the United States Census Bureau to tabulate population and other census statistics within the Unorganized Borough; they have no legal basis in Alaska state or federal law other than for electoral representation and federal financial assistance purposes. ^ Unlike in Massachusetts, Connecticut's regional councils do not conform to the old county lines, but rather, they are composed of towns that share the same geographic region and have similar demographics. ^ Prior to July 1, 2016, there were 42 independent cities. At that time, Bedford, Virginia, gave up its city status and became a town within Bedford County. ^ The State of Alaska has 19 organized boroughs and one Unorganized Borough divided into 10 census areas. ^ The United States Census Bureau and the Office of Management and Budget consider the entire District of Columbia to be a county equivalent. ^ The State of Louisiana has 64 parishes instead of counties. ^ The State of Maryland has 23 counties and the independent City of Baltimore. ^ The State of Missouri has 114 counties and the independent City of St. Louis. ^ The State of Nevada has 16 counties and the independent Consolidated Municipality of Carson City. ^ The Commonwealth of Virginia has 95 counties and 38 independent cities. ^ Guam does not have counties. All of Guam is counted as one county-equivalent by the U.S. Census Bureau. ^ The Northern Mariana Islands do not have counties. The U.S. Census Bureau counts the 4 municipalities of the Northern Mariana Islands as county-equivalents. ^ Puerto Rico does not have counties. The U.S. Census Bureau counts Puerto Rico's 78 municipalities as county-equivalents. ^ The U.S. Minor Outlying Islands do not have counties. The U.S. Census Bureau counts each of the 9 island groups in the U.S. Minor Outlying Islands as county-equivalents. ^ The Minor Outlying Islands have no permanent residents. All reported population consists of temporary military and scientific habitation. ^ The United States Virgin Islands do not have counties. The U.S. Census Bureau counts the 3 main islands (Saint Croix, Saint Thomas and Saint John) as county-equivalents. ^ a b https://www.britannica.com/place/Kingman-Reef Kingman Reef. Britannica.com. Retrieved July 7, 2018. ^ a b c d http://www.statoids.com/uum.html Territories of United States Minor Outlying Islands. Statoids.com. Retrieved July 6, 2018. ^ a b c d "An Overview of County Government". National Association of Counties. Archived from the original on April 17, 2013. Retrieved April 25, 2013. ^ a b c d "County Totals Datasets: Population, Population Change and Estimated Components of Population Change: April 1, 2010 to July 1, 2012". 2012 Population Estimates. United States Census Bureau, Population Division. March 2013. Archived from the original on July 7, 2013. Retrieved April 30, 2013. ^ "2010 Census Geographic Entity Tallies by State and Type". United States Census Bureau. ^ a b c d e f g h https://www.census.gov/geo/reference/codes/cou.html 2010 FIPS Codes for Counties and County Equivalent Entities. Census.gov. Retrieved July 6, 2018. ^ a b c d e f g https://www2.census.gov/geo/pdfs/reference/GARM/Ch4GARM.pdf States, Counties, and Statistically Equivalent Entities (Chapter 4). Census.gov. Retrieved July 6, 2018. ^ a b http://www.statoids.com/yas.html Counties of American Samoa. Statoids.com. Retrieved July 6, 2018. ^ Harch, Charles E. (1957). The First Seventeen Years, Virginia, 1607–1624. Jamestown 350th Anniversary Historical. pp. 20, 75–76. ^ Reynolds, Osborne M., Jr. (2009). Local Government Law (3rd ed.). St. Paul: West. p. 19. ^ "Learn About What What Counties Do". National Association of Counties. Retrieved November 20, 2015. ^ Rubino, Joe (December 24, 2011). "Broomfield 50th anniversary: Success in first 50 years stemmed from bold actions". Broomfield Enterprise. Retrieved July 13, 2012. ^ "Broomfield History". City and County of Broomfield. Retrieved July 13, 2012. ^ Viechnicki, Joe (January 3, 2013). "Petersburg Becomes 19th Borough In Alaska". Alaska Public Media. ^ "Alaska Statutes Title 29 Chapter 03. The Unorganized Borough". Local Government On-Line, Division of Community and Regional Affairs, Alaska Department of Commerce, Community and Economic Development. August 18, 1998. Archived from the original on April 15, 2009. Retrieved July 17, 2008. ^ "Local Government in Alaska" (PDF). Local Boundary Commission, Alaska Department of Commerce, Community and Economic Development. February 2001. Archived from the original (PDF) on July 18, 2008. Retrieved July 17, 2008. ^ "Population and Area of All Virginia Local Governments, 1790–2010" (PDF). Virginia Department of Housing and Community Development. April 19, 2012. Retrieved January 25, 2013. ^ Geography, US Census Bureau. "US Census Bureau Geography 2010 FIPS Code Files for Counties and County Equivalent Entities". Census.gov. Retrieved November 2, 2017. ^ http://www.hl7.org/fhir/valueset-fips-county.html FHIR. US counties and county equivalent entities codes. US Realm Taskforce Work Group. Retrieved July 6, 2018. ^ a b https://www.usgs.gov/faqs/how-many-counties-are-there-united-states How many counties are there in the United States? USGS.gov. Retrieved July 6, 2018. ^ https://www2.census.gov/geo/maps/metroarea/stcbsa_pg/Feb2013/cbsa2013_GU.pdf Guam Election Districts. Census.gov. Retrieved July 6, 0218. ^ a b Kane, Joseph Nathan; Aiken, Charles Curry (2004). The American Counties: Origins of County Names, Dates of Creation, and Population Data, 1950-2000. Scarecrow Press. p. vii-xii. ISBN 978-0-8108-5036-1. ^ Reynolds, Osborne M., Jr. (2001). Handbook of Local Government Law (2nd ed.). St. Paul: West Group. p. 26. ^ "Connecticut State Register and Manual, Section VI: Counties". Connecticut Secretary of the State. Retrieved January 23, 2010. There are no county seats in Connecticut. County government was abolished effective October 1, 1960; counties function only as geographical subdivisions. ^ "Facts & History". Retrieved January 23, 2010. Rhode Island has no county government. It is divided into 39 municipalities each having its own form of local government. ^ "Direct links to all 24 Maryland Local Education Agencies' web sites". Retrieved January 22, 2011. ^ Faulconer, Justin (July 1, 2013). "Bedford reversion to town becomes official today". The News & Advance. Lynchburg, VA. Archived from the original on October 20, 2013. Retrieved July 22, 2013. ^ "Table 358. Land and Water Area of States and Other Entities: 2008". Statistical Abstract of the United States: 2012. United States Census Bureau. May 1, 2008. Archived from the original on July 7, 2013. Retrieved April 30, 2013. ^ a b c d e f "American FactFinder". United States Census Bureau. Retrieved December 27, 2016. ^ http://www.statoids.com/ump.html Municipalities of Northern Mariana Islands. Statoids.com. Retrieved July 7, 2018. ^ http://www.statoids.com/uas.html Districts of American Samoa. Statoids.com. Retrieved July 7, 2018. ^ https://www.britannica.com/place/Swains-Island Swains Island. Britannica.com. Retrieved July 7, 2018. 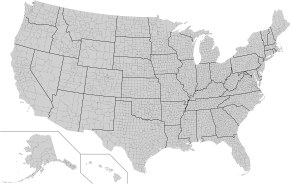 Wikimedia Commons has media related to Counties of the United States.